The Best Cotton Sheets – what makes them the best cotton sheets, who manufacturers them, and why you should buy these cotton sheets instead of your current brand. When Hubby and I were setting up the Florida condo, we did a lot of shopping. One of our earliest purchases was a new mattress and box spring so we could quit the hotel. I have been buying the sheets from the same manufacturer for years, but had yet to order as Hubby and I were undecided whether to buy a queen or king bed (we went with a king in Florida, but have a queen at home in New York). Since we needed sheets to use the newly delivered mattress, we ran over to Tuesday Morning and bought a $100, 600 thread count Egyptian cotton set. Sheets are sheets, right? And a higher thread count means a better sheet, right? And Egyptian cotton, that is a safe bet, right? Turns out all those assumptions were very wrong. When we got back to the condo with our purchases, I immediately ran the sheets through the washer so we could use the bed. Nothing beats a nice, fresh, clean set of sheets at night!! The next morning, Hubby complained the new sheets had pills. Well, since my side didn’t have pills, I ignored the complaint. The next time I washed those sheets was on our return to the condo in January. Now, I am one that will use the same set of sheets F-O-R-E-V-E-R. I am not a good sheet folder (Hubby is), and so it is easier for me to just wash, dry, remake the bed with the same set. After the second washing I put the sheets back on the bed. That night, I felt a few pills at my feet. Now, I am not the Princess from the Princess and the Pea – far from it. Heck, I slept on the floor whenever possible from the time I was a little kid until I was 40. Hubby put the kibosh on that pretty darned quick. He was horrified that my ex-husband took the mattress set when we divorced, and I never replaced it. I slept on the floor. Because I liked to. So, needless to say those few sheet-pills at my feet didn’t bother me too much. I just shifted around a bit to avoid them, and all was well. By this time I had forgotten that these were the sheets from Tuesday Morning and not the brand of sheets we’d been buying for years. After the third wash, I was extremely disappointed in my regular brand, ready to put out a nasty-gram expressing my angst in not-so-polite-terms. There were pills all the way up the sheets, and sleeping on them had become a tad uncomfortable, even for me! “What happened! ?” was all I could wonder. About this time Hubby was putting on the louver doors in the second linen closet, and he emptied out the linens I had placed in there (so they’d be out of the way). Tripping over one of the boxes of those removed linens, guess what I found? Thankfully, I had never sent out that nasty-gram. I immediately washed the good sheets, stripped the bed and then washed the Tuesday Morning sheets and had Hubby fold and pack them away as a spare (read: desperate) set (to be tossed as soon as I order another set). So what are these good sheets? We have purchased the Thomas Lee PerfectCale sheets since I read about them online years ago, and decided to take a chance. I had become disgusted with what I was buying in the store, and didn’t want to pay the big bucks at Scandia Down. In my opinion sheets today aren’t the sheets you could purchase 20-30 years ago. Maybe they are no iron (which turns out is half the problem), but for the rest? The sheets today seem thinner, the pockets not as deep (ironic as beds are all pillow top these days), they shrink and pill and do all sorts of things that the sheet sets of yesteryear just didn’t do, which makes for a less than wonderful sleeping experience. When I read all the glowing reviews about the Thomas Lee sheets, I figured they either paid a lot of people for good reviews, or they made an excellent product. Over the years, I have come to the conclusion that they make an excellent product. The Thomas Lee sheets don’t shrink, pill, fade or thin-out. That first set I bought years ago is as good today as it was when I purchased it – probably better because it is even softer (or so it seems). The American grown Pima Cotton used in Thomas Lee bed linens is actually better than Egyptian Cotton. The best cotton sheets are made with single ply ring spun yarn. The finer the yarn the finer the fabric. Ring spinning produces the only single ply yarn fine enough to manufacture a true 500 thread count bed sheet. Inferior quality bed sheets are made with faster and less costly yarn spinning technologies that have significant quality limitations. Additionally, lower quality sheets are frequently made with plied yarns, where two to four strands of yarn are twisted, or plied, together to produce a single strand of yarn. Then the seller overstates the thread count. Most sheets claiming a thread count in excess of 500 threads per inch are made with plied yarns and have an actual thread count of ½ to ¼ of the claimed amount. This questionable practice results in not only a misleading overstatement of actual thread count, but creates a fabric made with lower quality yarn. The United States Federal Trade Commission has issued an opinion that this practice likely deceives consumers. In fact sheets that claim thread counts of 1000 are generally made with yarn that has been plied as many as 4 TIMES. The real thread count is actually 250. The Thomas Lee sheets are full enough to cover the entire mattress without gymnastics. I just put on a corner, and then pull it down afterward. The end. No tugging, no pulling, so hoping the one corner will stay down as I run over to put another corner on the bed. They are a nice weight – not to thin, not to thick. We use them on our bed in New York State, and down in Florida. Are they cheap? No, not really. But in the long run they are cheaper than buying thin, uncomfortable, less expensive sheets that I have to throw away. The coupon code FB110 seems to always take 10% off you order, which is nice. They offer free shipping on orders of $150+, and it takes about a week from the time I order until they arrive. They do offer a 90 day MBG if you are dissatisfied, or you can get a free swatch if you don’t want to tale the plunge. They also carry bamboo sheets which I have never tried. Unless they change something drastically, it is unlikely we will ever buy another brand; the Thomas Lee sheets are a great bang-for-the-buck. We learned our lesson after those horrible Tuesday Morning sheets, and bought only Thomas Lee sheets for the guest bedroom. I still need to buy a spare set for the master down in Florida, but will be doing that prior to our return. Who manufacturers your favorite sheets? For more Ann’s Entitled Life Library topics, click here. If my husband would let me, I would use flannel sheets all year long. I hate going to bed and feeling cold sheets even in the summer. I love how soft and snuggly they are too. For pillow cases, I once purchased some cheap jersey knit pillow cases after something tragic happened to ours and I have yet to replace them. The good people who sell to Target??? That cracked me up, Stephanie. I don’t think I’ve ever had flannel sheets. I think Hubby would be against them though … the hot Latin guy and all that. LOL Our bad sets ended up being covers for furniture – either when we go away, or when construction is going on in the house. There is always a use for old sheets! Are the Thomas Lee sample swatches sent to customers in Canada? Your directive only gave me the States in the U.S.
Lenore, I would email them and ask. 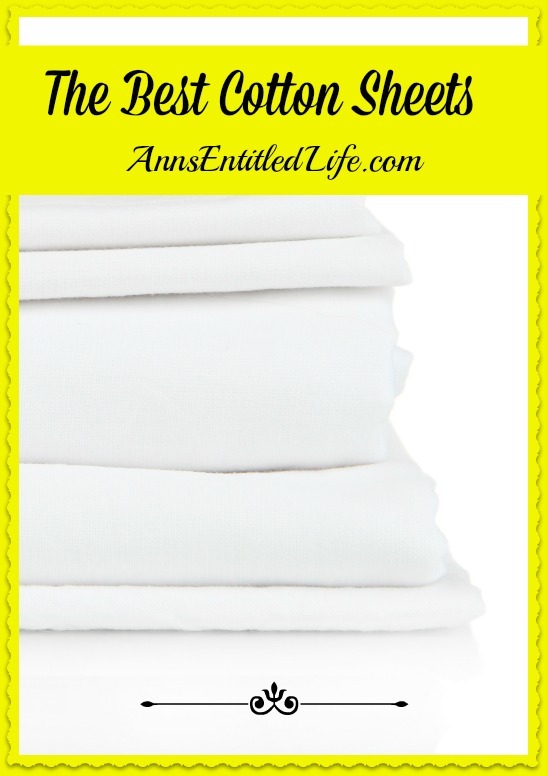 Hi Ann – I enjoyed your blog about Thomas Lee bedding. I just ordered my first set tonight. Here’s my question – the care instructions on the site recommends NOT using any fabric softner or fabric sheets. What? This was so surprising to me. Do you put wash yours without? I also am one to bleach white sheets …. but going to try and refrain I guess… 🙂 Thoughts please? I hope you enjoy your sheets as much as we do, Carol. I use Downy free and clear fabric softener all the time on my sheets. I do not use bleach. The bleach will break down fibers, so I get that, but I am unsure of the rational behind no fabric softener. I bought a set of Thomas Lee white Pima sheets a couple of months ago and I love them. They are expensive but for me it is worth it. I wouldn’t buy them for my teens rooms but for my master bedroom I’m hooked. I agree with you completely, Kevin. We have not bought anything besides the Thomas Lee in years! I just purchased a blanket, but have not opened it up yet. The price made me hesitate, but I am hopeful it will be just as wonderful as these sheets! I love Thomas Lee and use some of their products…only hubby and I use two Twin comforters on our King bed and we have a twin bed in one guest room so I miss that Thomas Lee does not sell Twin sizes. Healthy is my top priority and I like USA made when possible. I wish more people would consider these priorities. I have been an owner of Thomas Lee sheets for 2 years. LOVE THEM. They are very strong, yet soft, cool to lay on, and hold up well over the past 2 years. I use bleach every other wash (only a 1/4 cup tho…) and i use very very little softener. I did not use any of this for the first 3 months – it is not necessary but i use bleach just for sanitary purposes… bleach has no negative effects on my sheets over the past 2 years.